Launched in 2002, the Gravity Recovery and Climate Experiment (GRACE) satellites have provided a unique view of regional-scale changes in the Earth’s gravity field for more than a decade. Over the course of its mission, the temporally changing gravity fields estimated from minute variations in the separation between the two spacecraft have been used to study ocean current changes, crustal uplift due to earthquakes and the on-going adjustment of the Earth to the ice sheets that existed in the last ice age. On a seasonal time scales, GRACE data has been used to estimate the water fluxes in and out of river basins to generate a better understanding of drainage basin-scale hydrology. Jerry Mitrovica, Georgia Fotopoulos and I looked at a combination GRACE data, rainfall estimates and river discharge datasets to estimate how net precipitation and evpotranspiration had changed over the first seven years of the GRACE mission. Another common use of GRACE gravity observations is in the estimation of the melting of the polar ice sheets. An under-appreciated issue in many of the GRACE-based interpretations is that the change of mass associated with the ice melt also changes the nearby sea-level due to lithospheric uplift and a reduced gravitational attraction between the ocean and the diminished mass of the ice sheet. 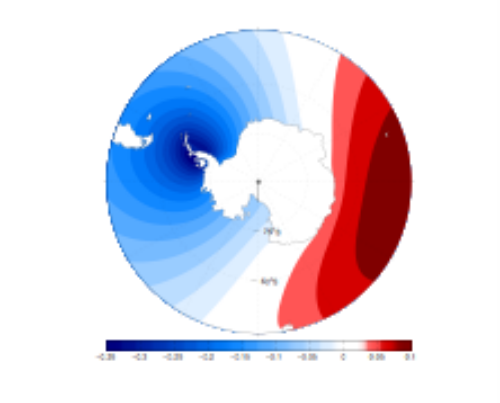 Work with Glenn Sterenborg and Jerry Mitrovica has demonstrated that, depending on the location and geometry of the melt and the applied processing techniques, such secondary effects can significantly bias the estimates of mass change.